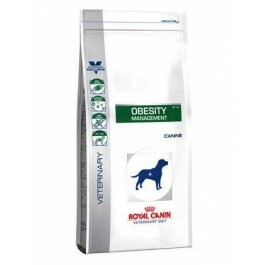 Royal Canin Obesity Management is a complete dietetic feed for dogs formulated to reduce excessive body weight. A high protein content (109g/1000kcal ME) helps maintain muscle mass during a weight loss programme. Enriched with nutrients (protein, minerals and vitamins) to compensate for the effect of energy restriction ensuring during a weight loss programme. Essential fatty acids (Omega 3 and Omega 6) and trace elements (Cu, Zn) support healthy skin and coat. COMPOSITION: dehydrated poultry protein, wheat, vegetable fibres, beet pulp, maize gluten, wheat gluten*, hydrolysed animal proteins, animal fats, minerals, fish oil, psyllium husks and seeds, hydrolysed crustaceans (source of glucosamine), marigold extract (source of lutein), hydrolysed cartilage (source of chondroitin). ADDITIVES (per kg): Nutritional additives: Vitamin A: 21700 IU, Vitamin D3: 1100 IU, E1 (Iron): 40 mg, E2 (Iodine): 4 mg, E4 (Copper): 5 mg, E5 (Manganese): 52 mg, E6 (Zinc): 156 mg, E8 (Selenium): 0.06 mg - Preservatives - Antioxidants. ANALYTICAL CONSTITUENTS: Protein: 34% - Fat content: 10% - Crude ash: 7.5% - Crude fibres: 7.6% - Per kg: Metabolisable energy: 3116 kcal - Omega 6 fatty acids: 22.3 g - Omega 3 fatty acids: 4 g.
This food should be recommended by your veterinary surgeon. For detailed information on feeding amounts and how this food can help your pet, please consult your veterinary surgeon. Royal Canin Canine Satiety Support Weight Management is a complete dietetic feed for dogs formulated to reduce excessive body weight.